As the last line of defense, having a goalkeeper who is not only a stabilizing force game-in and game-out, but can also make the game-saving stop when required is a key element for any side to compete for a championship. 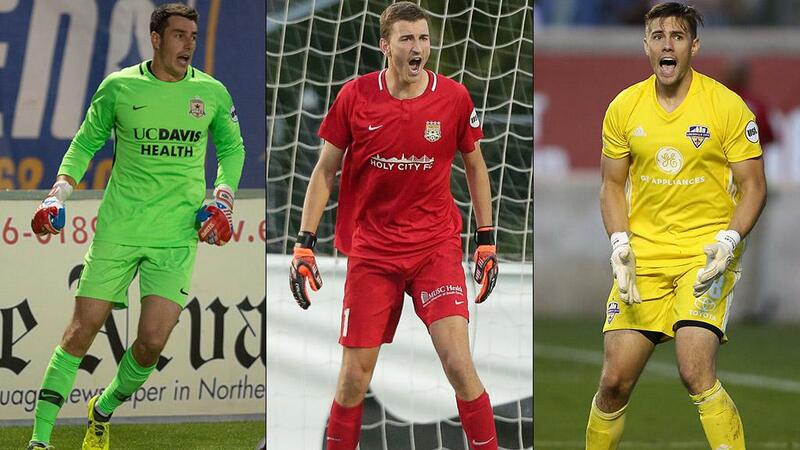 Here are 10 goalkeepers that are going to be looking for big seasons in the upcoming USL Championship campaign, with experienced, award-winning veterans joined by two young standouts that should command attention this year. It’s fair to say that Diego Restrepo’s follow-up campaign to his 2017 USL Championship Goalkeeper of the Year award didn’t play out as he’d hoped with San Antonio FC. In fact, by the end of the season he had lost his regular starting spot to SAFC’s Matt Cardone. That will give the 31-year-old something to prove as he makes the short journey to expansion side Austin Bold FC for the new season. Becoming part of a veteran squad that is expected to compete immediately under Head Coach Marcelo Serrano, you can expect that Restrepo – along with teammates Kris Tyrpak and Sonny Guadaramma – have had Bold FC’s home opener on March 30 against their former club circled since the schedule was announced in December. After serving as a back-up in his rookie season behind Battery veteran Odisnel Cooper, Joe Kuzminsky claimed the starting position early in the 2018 season and went on to produce a stellar campaign that helped the Battery to a top-four finish in the Eastern Conference. Sporting a 74.7 save percentage, 12 shutouts and two penalty saves, the 25-year-old should enter the new season as Charleston’s No. 1. A second consecutive campaign with those sorts of numbers could start to turn heads from higher levels for the 6-foot-4 Colorado native, and help the Battery keep their streak of reaching the USL Cup Playoffs in every season of the league’s history moving. The 2018 Championship campaign ended with Evan Newton having claimed the league’s Golden Glove award with a 0.80 goals-against average, but on the bench for FC Cincinnati as it entered the USL Cup Playoffs with Spencer Richey taking the starting spot for the side down the final stretch of the season. While that was the case, Newton’s resume made him one of the biggest additions for the Eleven in an offseason of splashy signings for Head Coach Martin Rennie’s side. With 37 regular-season shutouts in the Championship, Newton sits second all-time in the league’s history and could be in line to become its all-time leader as he sits three clean sheets back of Odisnel Cooper’s mark entering the year. The new season marks a homecoming for 20-year-old Abraham Romero, who joins the LA Galaxy II after spending the first two years of his professional career with Liga MX side Pachuca. A former member of the Galaxy Academy, Romero helped the Mexico U-17 National Team reach the semifinals of the 2015 FIFA U-17 World Cup as part of a side that defeated both Germany and Argentina in the group stages before falling to eventual champion Nigeria in the final four. The 6-foot-3 Romero will compete for time with fellow young standout Eric Lopez in Los Dos’ goal this season and will be hoping to impress as he dons the Galaxy’s colors once again. Filling the shoes of a two-time USL Cup champion is never easy, but that’s the potential task facing Louisville City FC goalkeeper Tim Dobrowolski as he enters the 2019 season. With the offseason move of Greg Ranjitsingh to Orlando City SC, the backup for the past three seasons at Slugger Field is in line to compete with loan arrival Ben Lundt from FC Cincinnati for the starting job. Dobrowolski has been a solid option in relief for LouCity with a 67.4 save percentage and four shutouts in 17 appearances for the club in league play – his save percentage ranks higher than Ranjitsingh’s (62.4) over the same span – but stepping into the lead role is always a challenge, especially for a club with LouCity’s expectations. The 2018 campaign didn’t go to plan for Cody Mizell as he returned for his second stint with the Tampa Bay Rowdies after two solid years with the Charlotte Independence. Reuniting with former Independence assistant Troy Lesesne as he leads New Mexico United into its inaugural season, however, offers hope that the 27-year-old can produce a bounce-back season for the expansion franchise. Should Mizell come close to the 70.3 percent save percentage he produced as a member of the Independence, it should help ensure New Mexico a place among the playoff contenders at the end of the regular season. North Carolina FC missed out on a place in the USL Cup Playoffs in its first season in the league, but goalkeeper Alex Tambakis was one of the shining lights for the side in his first season at the club. The Greek shot-stopper finished with 95 saves in the regular season, third-most in the league, while producing some highlight-reel stops that were consistently among the contenders for the USL Championship Save of the Week. Tambakis couldn’t stop everything, but he was surehanded in his 33 appearances, going without an official drop according to Opta while making 12 catches and nine punches. If North Carolina’s defense can reduce the 144 shots on goal he faced in 2018, an uptick in his 66 percent save percentage could also be on the cards. It wouldn’t be accurate to call 2018 a breakout year for Josh Cohen, but it certainly was the best of his career so far and was rewarded with a first All-League selection for the California native. The 26-year-old registered 117 saves in the regular season, second-most in the league, while putting up 12 shutouts as he played every minute of the regular season to help carry Republic FC to a second-place finish in the Western Conference. That success didn’t carry into the playoffs as Sacramento was eliminated in the conference quarterfinals by the Swope Park Rangers, but with 25 clean sheets over the past three seasons, Cohen should be primed for another big year that Republic FC fans will be hoping ends in a second title. A former standout in the Sounders FC Academy, Trey Muse was one of the notable Homegrown Player signings this offseason after a stellar two-year career at Indiana University. With Stefan Frei still the man in Seattle, though, it’s likely Muse will get plenty of chances to shine for S2 this season, particularly as he makes his case for inclusion in Head Coach Tab Ramos’ squad for the FIFA U-20 World Cup this May. A First Team All-American and the Big Ten Goalkeeper of the Year last fall, the 19-year-old Muse posted a 0.54 goals-against average and 12 shutouts as the Hoosiers reached the final of the NCAA Tournament before falling to Maryland and is considered one of the top prospects in the United States pipeline. A big year for club and country would only add to that reputation. After the departure of late-season starter Daniel Vega to the San Jose Earthquakes this offseason, the Rowdies needed to solidify a position that was unsettled to say the least a year ago. Enter what looks on paper to be the ideal solution in former Philadelphia Union backup goalkeeper John McCarthy, who departed the MLS side this offseason looking for a chance to be a No. 1 starter. Longtime USL Championship fans will be familiar with the 26-year-old, who was both the league’s Goalkeeper and Rookie of the Year in 2014 for the Rochester Rhinos before joining the Union the following offseason. With the Rowdies looking for a bounce-back season, McCarthy will provide a solidity between the sticks the side missed after the departure of Matt Pickens last offseason.